It has been a while since I've been active on the forum. Been moving around a lot for work and have finally landed in Seattle, WA. As such my life's priorities are changing and with that I have decided it is time to let go of my true love, the G8. She had been in storage since 2016 (I bought her in 2014 with ~25k miles on her from Doug, who used to be a forum member here), with bi-annual oil changes, fuel drain/refill/stabilized (91 octane pure gas, no ethanol has ever touched her lips) and drive to get her hot and clear any condensation. Pulled her out of storage this year and had her checked over by the GM dealership. They swapped out the passenger seat airbag module and the car passed with flying colors. Drove her to Seattle, super fun trip, and she has become a garage queen once again. 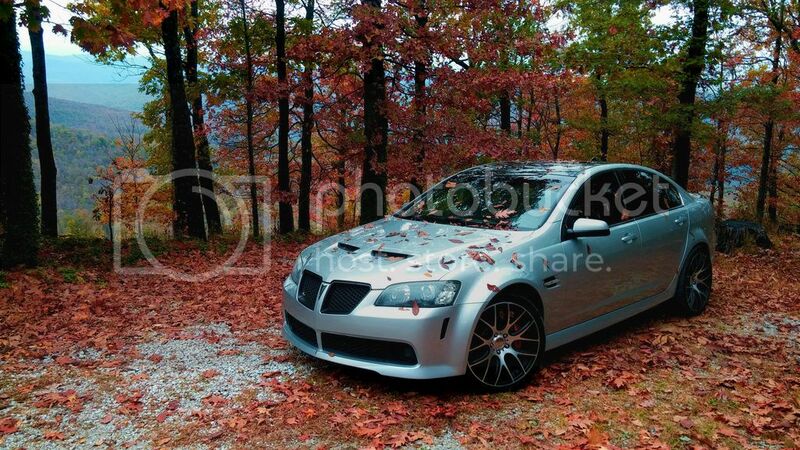 -2009 G8 GT, Premium and Sport Package, heated leather seats, sun roof. Currently has 55,000 summer only miles. -Has always drank 91 octane, ethanol free gasoline, full synthetic Mobil 1 oil/filer every change, never track ran, weekend grocery getting with some twisties every so often. -Car has never been in an accident, only major work was a chipped windshield that had to be replaced under insurance. -No major bodywork, I had the front bumper paint touched up prior to having the front end wrapped in a Clearbra. -Clearbra wrap from the front back to the sunroof, as well as a section behind the trunk, all professionally installed. I have supporting documents if you would like. -Prior to the wrap I had the paint professionally corrected/detailed/claybared and sealed in Opticoat PRO hydrophobic ceramic sealant which comes with a lifetime warranty. Warranty card is with the car's paperwork. -The car has one open recall for the switchblade key swap out for non-switchblade type. I never had it done because I like the switchblade type and it is a dumb recall. If you have a problem with the open recall, tell me and I can have it done in an afternoon. -Other than that the car is in excellent shape and runs great, it will need tires/balance/alignment and brake pads soon. Price reflects this. If it doesn't sell quickly I will end up doing it myself and raising the price a little. -Extras that come with the car, 2nd set of brand new OEM floor mats still in original packaging, custom all weather mat for the trunk with Pontiac arrowhead, custom blue silk car cover for indoor storage, superchips tuner, low clearance Race Ramps that fit perfectly under the front bumper. I probably have some other G8 specific items that I have forgotten about here. I'm asking for $18,300. Willing to entertain a trade+cash for a 2016 or newer Canyon/Colorado 4x4. Full disclosure: I've been offered a trade-in value of $16,200 ($17,820 with tax incentive, 10% tax here) from a local GM dealership (Bill Pierre Chevrolet) but I would really prefer that someone who will care for this car get it instead. I have the Carfax that I ran 2 days ago if you are interested. I am willing to deliver the car within reason, I live in South of Seattle, WA. Let me know if you have additional questions and thanks for looking. Link for photo/video below (hopefully it works), I am actively adding more as I get the time. There is a video walkthrough in there that I did yesterday. Car needs a light detail but I can do that prior to a sale. Mods: Forged 6.0, 3600 Coan, GPI SS3 Cam, Milled LS3 Heads, VCM, RCR Intake, tuned by GPI.